If the trip takes less than 15 hours in the car, my family drives. It’s a thrifty decision that never fails to irk me, since I love plane rides and loathe sitting in the car for long durations of time. And yet, as I get older, I find myself willing to drive farther and farther distances in the pursuit of saving money. Being a prudent traveler is encoded in my DNA, apparently. This spring break is no exception. My friends and I are driving down to Ft. Lauderdale to participate in what appears to be some sort of senior-spring-break rite of passage: going on a cruise. 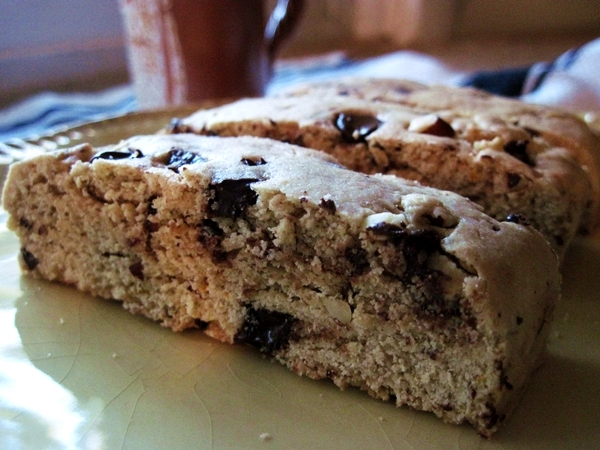 The answer is constantly laying on my family’s kitchen countertop: biscotti. My mom has been on what can only be described as a biscotti kick. Every time I come home, there’s a new variation, a new flavor addiction to form and then try to combat with other dippable foods. This technique rarely works, and I end up finishing whatever biscotti my other family members did not consume between breakfast and dessert. No doubt that these biscotti would’ve turned my teenage angst/resentment toward having to drive all the way to upstate New York into something resembling appeasement. 1) Preheat oven to 350 degrees. Grease a baking sheet, or line with a Silpat. 2) In a large bowl, combine the butter and sugar until smooth and creamy. Beat in the eggs one at a time, then add the almond extract. 3) Add the flour and baking powder and stir until just blended. 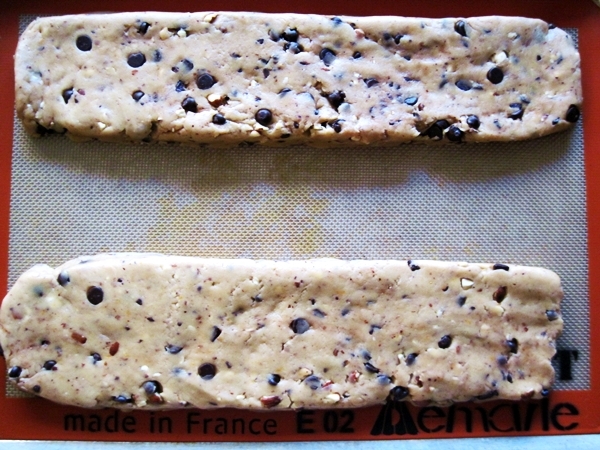 Mix in almonds, chocolate chips and orange rind. 4) On the baking sheet, shape the dough into two 10-inch long by 3-inch wide loaves, a little more than 1/2-inch in thickness. Keep a few inches of space between the loaves. Bake for 20 to 25 minutes, until set. Cool for seven or so minutes. (The loaves don’t crumble as much when they’re cut still warm.) Cut the loaves into 1/2-inch slices with a serrated knife. 5) Lower oven heat to 300 degrees. Place biscotti slices back on baking sheet, one of the cut sides facing up, and bake for five minutes. 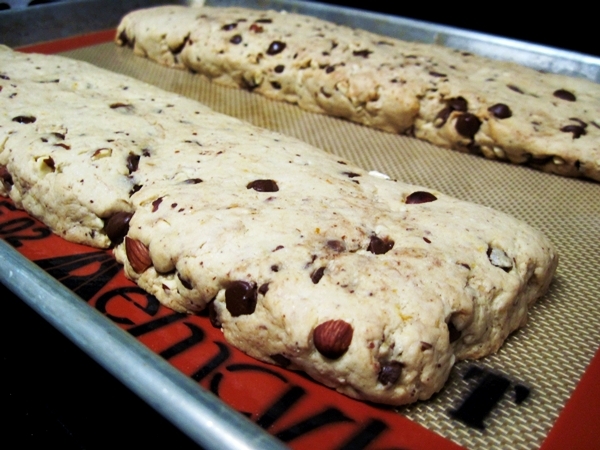 Remove the baking sheet from the oven, flip the biscotti, and bake for another five minutes. 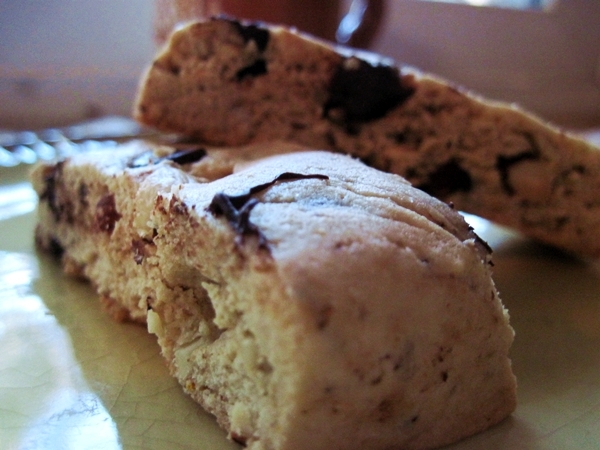 Let biscotti cool before placing in an airtight container. 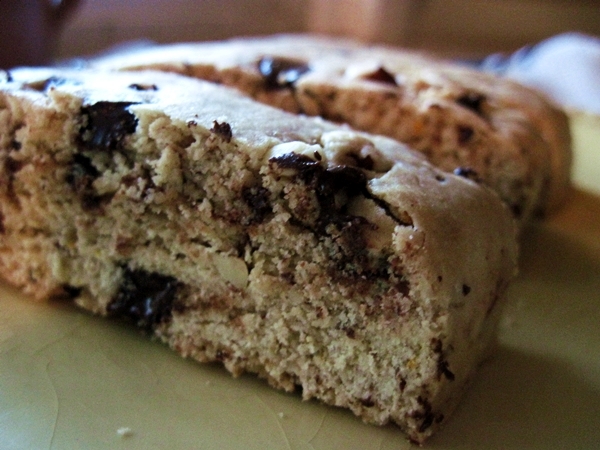 This entry was posted in breakfast, dessert and tagged almond, biscotti, chocolate, orange. Bookmark the permalink. Can I go ahead and order these as a wedding gift for that super long road trip Dan and I are doing 😀 They look incredible.